When a forest is no longer a forest. On the first day, a few hours before dusk, we crossed a river, wading thigh-deep and slipping on smooth rock as the water tried to push us downstream. To our left, tall, straight rubber trees oozed slow white streams, oblivious to the monkeys dashing inelegantly along their branches. To our right, the oil palms were an illusion of forest, shading us with green, only their regimented formation and the bare ground at their feet to reveal the deception. 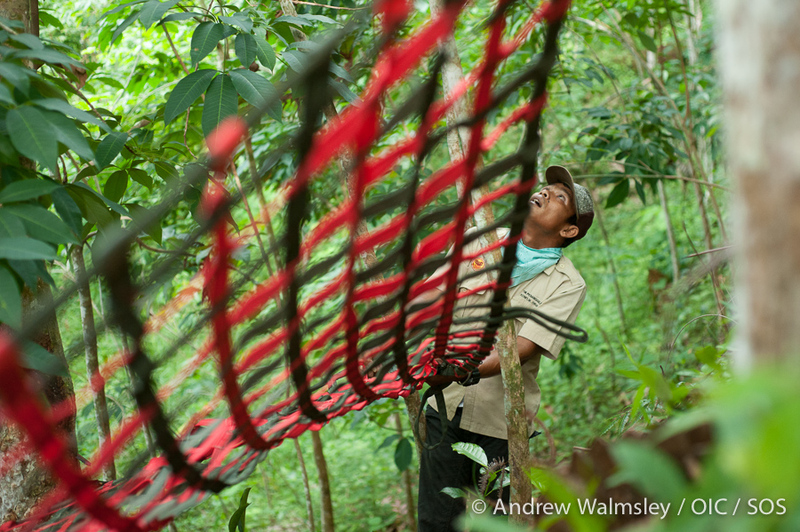 As we walked, we learned of labour-intensive rubber production affected by time and rain, and the relative ease of a crop that needs harvesting only once every two weeks. We learned of monkeys and orangutans eating the fruits of trees designed to supplement income, and as we crested a hill, we saw the brown furrows of a nearby peak denuded of its trees, bare and desolate and a barrier to the monkeys and orangutans choosing fruit elsewhere. On the second day, a few hours after dawn, we swelled in number and we crossed the river again. We passed through fields where even the oil palms were absent, only blackened trunks surviving the poisoning that makes way for a new generation. With increasing heat came decreasing talk, our solemn feet leaving the plantations further behind, tripping over roots and slipping into shallow water as the wild pushed its way past the rubber trees and came to meet us. 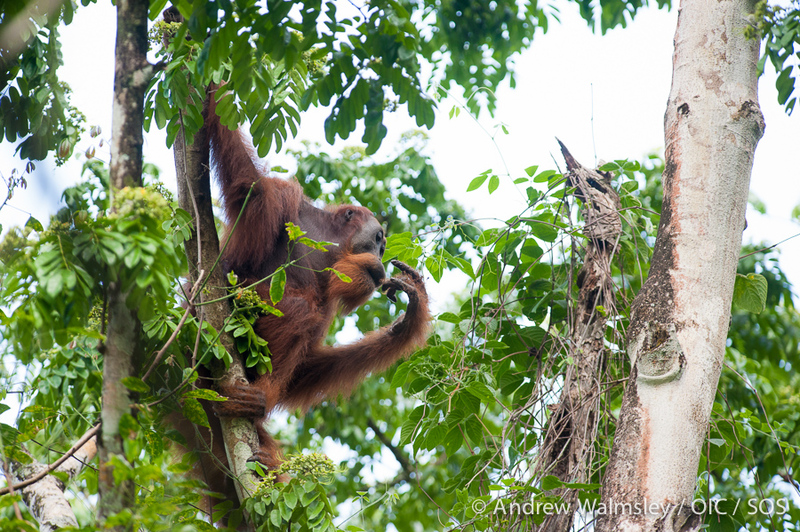 Hope flared with new nests above our heads, then disappeared as the branches we craned our necks towards stayed still in the hot, wet air and the orangutans remained in our imagination. The mosquitoes joined us on our search, their constant whine biting into our consciousness as the sting of their bites tattooed angry lumps onto our skin. 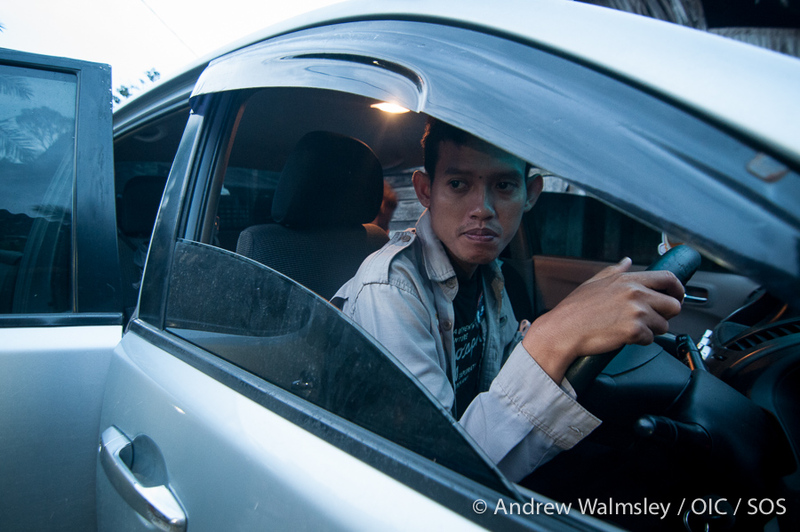 On the third day, we drove to Langkat, hopeful that the orangutans would not evade us there. Here, the palms were fewer and the forest feeling stronger, pervading our senses and making our footsteps clumsy in a habitat made for the arboreal. 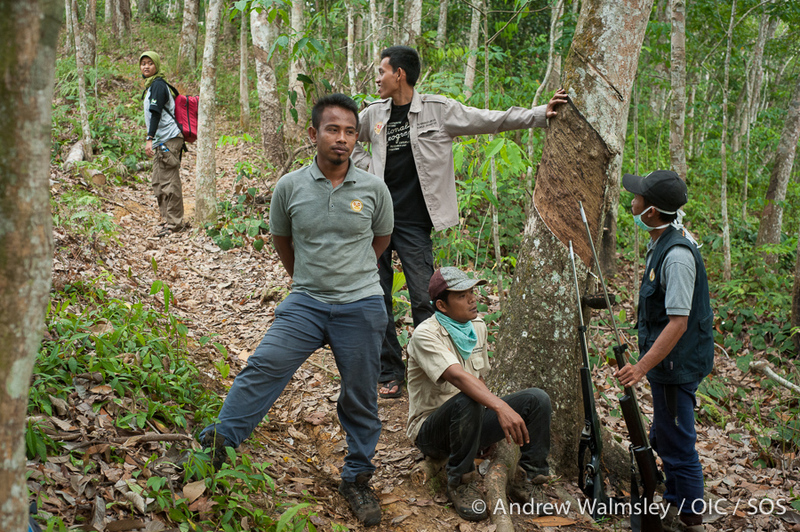 A farmer stopped us; he had seen an orangutan that morning and we followed his outstretched arm with our eyes and then our feet, coming to rest in the shadow of some tall trees where we caught our breath until a flash of orange took it away again. He swung effortlessly across our line of sight, demonstrating his long arms and reminding us that we’re earthbound. Stumbling more than walking, hands grabbing roots and clasping at thick soil in our hurry, we followed him to a pandan tree and sat on a fallen trunk to listen as he ate. We had found him, and now we could not lose him again. Four of us sat quietly at the edge of a path, watching as he rested in the heat of the day, and two drove to Medan, to find the vet, find the transport cage, and, with phone calls and negotiations, find him a safer place to live. As the hours wore on, we barely moved. We ate carefully as he slept, talked in hushed tones and followed him at a distance when he moved in search of food, our heads heavy and swimming in the heat as he led us into a valley where the mosquitoes reached fever pitch and the shriek of cicadas drilled into our brains. Contemplative, he ate termites from a piece of bark, then sat still for a while, moving only for an occasional cough as the sun began to dim from painful heat to muted light. A phone call from the road told us help was on its way, and we joked with quiet laughs as we waited. We started to get comfortable and he moved again, gaps between trees disappearing under his easy swing. We caught up with him at the pandan tree, his kiss-squeaks of warning fading to silence as we planted our feet and kept our heads low. Fruit in hand, he looked at us with mild interest and a trust that hit our stomachs with a fist of guilt. The chainsaws buzzed in the background as his careful hands picked the fruit apart, finding the best bits gently, slowly, because he had no idea his time was short. I focused my shaking hands and racing mind on my camera, fighting an urge to lie on the ground and cry. When angrily brushing tears away didn’t stop them chasing each other down my face, I sat and looked at him, silent with a sudden despair I hadn’t prepared for. He looked back, still calm, and I willed him to understand what we were about to do. He made his night nest as the team from Medan arrived, tired and frustrated and still negotiating a safe place to take him, so we left him in the gathering gloom of dusk, hoping he would still be there tomorrow. Tomorrow came at 5 am, with a hurried breakfast and clothes still damp from the days before. 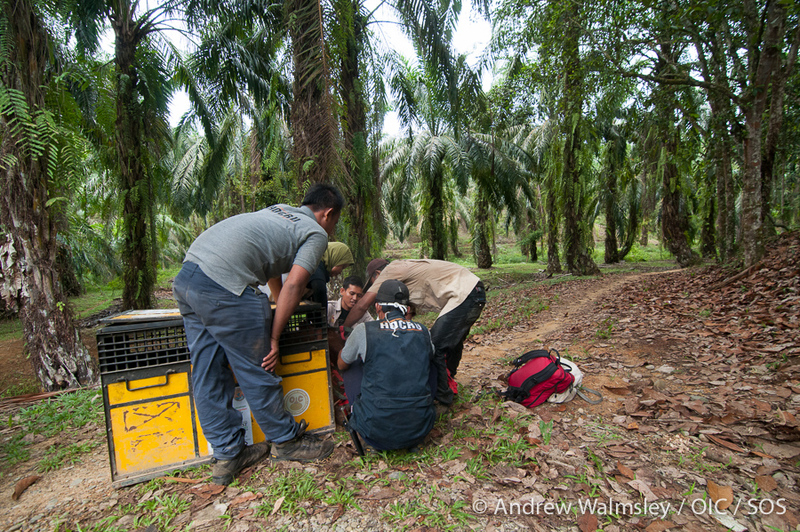 It was 22 degrees when we got in the car, then 28 as we left the village, then 32 as we assembled our equipment and our minds in the palm oil field at the boundary of his piece of forest. He was waking up as we got to the pandan tree by the path and moved away as the team got ready, perhaps, now, sensing what was to come. Quick and practised, the team went after him, the tranquiliser dart they carried all too real and stark. They caught up with him and then I caught up with them, his body suddenly diminished as he hung by one arm above the net they held ready. Minutes passed slowly and then all in a rush as he lost his grip and hurtled to the ground. His face in the net was beautiful in the saddest possible way as his long, nimble fingers reached out and found only thin air. Watching as if from a thousand miles away, I felt hope and grief spike light and heavy as human hands stroked long orangutan hair, reassuring him through the fear that pierced the sedatives and made his breath rasp. We walked out of the forest in file, his weight exhausting the men who carried him, and his strength overcoming the drugs one, two, three times. As we reached the slope that led us to the car, the newly naked stumps of trees seemed to taunt us, too glossy in their pale wood and halo of dust, and still the chainsaws sang. 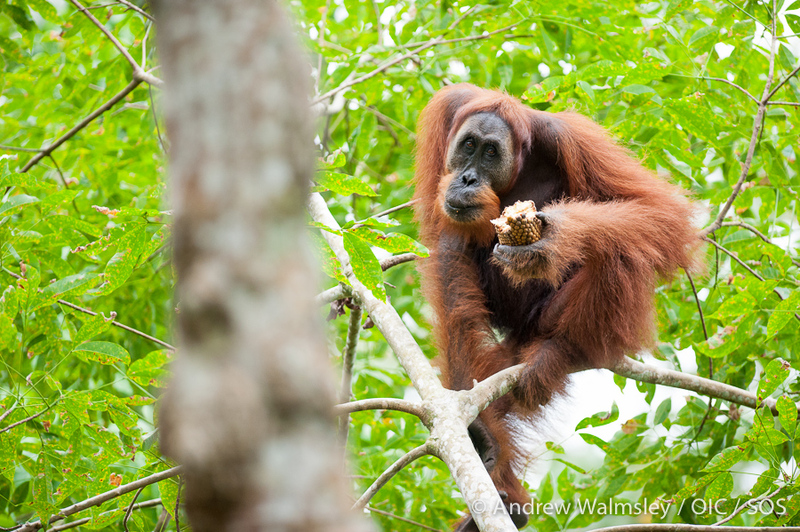 The orangutan in this story is a 60 kg young adult male who lived in fragmented forest that grows around farmed rubber trees in Langkat, North Sumatra. 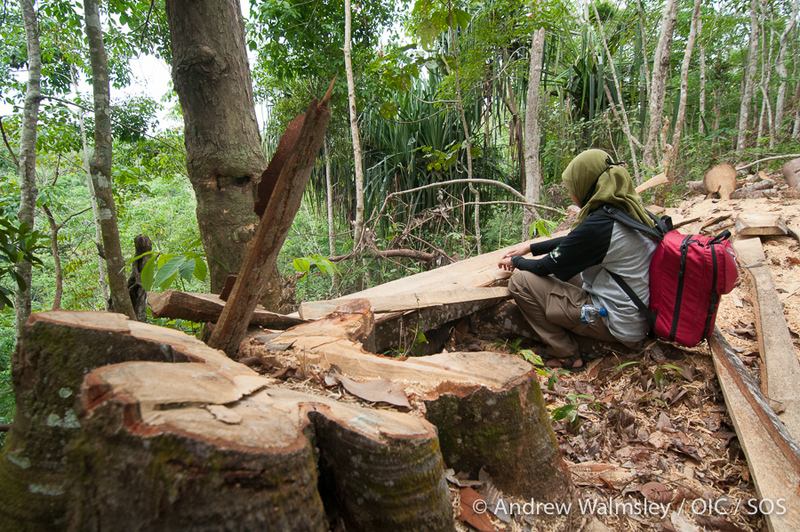 The fragment of forest is now bordered by palm oil, and every day the forest shrinks, chainsaws and bulldozers clearing it to make way for the palm oil plantations to expand. On 15th April 2014, Orangutan Information Centre’s (OIC) Human and Orangutan Conflict Response Unit (HOCRU) rescued the orangutan from a habitat no longer safe for him to continue living. 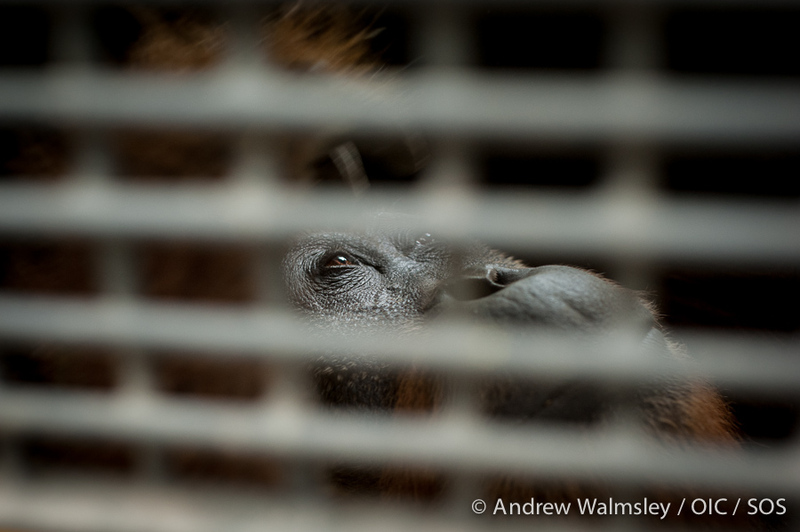 This is a last resort; it happens only when there is no other way to ensure an orangutan’s survival. 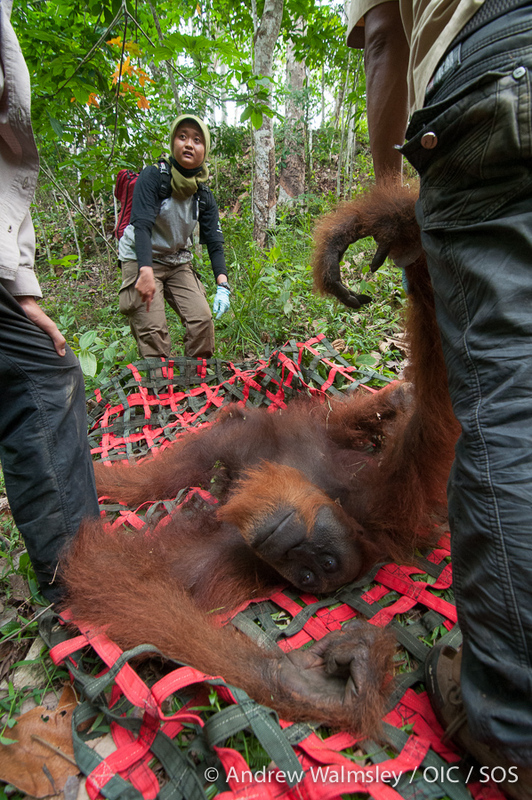 Later that day, after the events described above, the orangutan was taken to Sumatran Orangutan Conservation Program‘s quarantine facility, where he will remain for 30 days before being relocated to a new forest home. 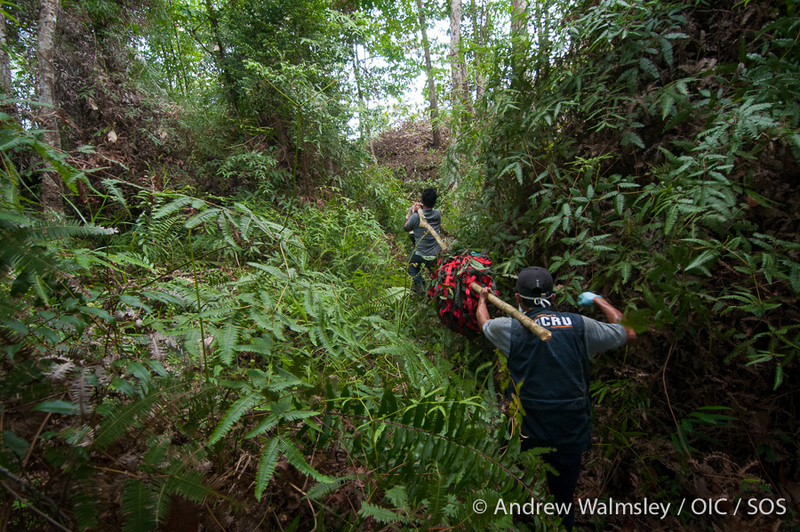 Along with wildlife photographer Andrew Walmsley, whose photos of the rescue appear above, I had the privilege of witnessing the dedication and hard work of the HOCRU team thanks to Sumatran Orangutan Society and, of course, the entire staff of OIC. I am incredibly grateful to them all. ← The happiness and the sadness. Thank you for your dedication and unrelenting compassion. I hope this destruction ends.